Uses a more expensive material (imported from Japan) called ETFE (ethylene-tetrafluoroethylene) versus PET (Polyethylene terephthalate ). The ETFE film layer absorbs light better with less reflection leading to more power per square inch. Made of Fiberglass back sheet. The ETFE material bonded with the fiberglass back sheet makes a stronger panel than a cheaper PET film one with less chance of cracking or water intrusion. 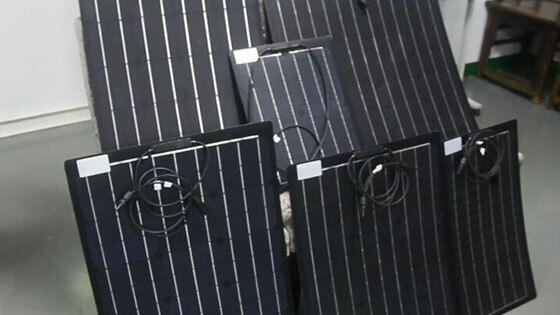 Sungold FP series flexible solar panes Production and Details pictures.